Despite the Daesh* terrorist group's territory in Syria continuing to shrink, many of its members are refusing to give up and clinging to the remaining sliver of land that they have under their control. Many of the hard-core Daesh* members who have decided to stay to make a last stand are foreign fighters, who went to Syria and Iraq in 2014-2016, with up to 50 of them being British citizens, the Daily Star reported. The British newspaper further wrote, citing sources in the YPG [Kurdish People's Protection Units], that a total of around 500 high-ranking Daesh* militants remain in Deir ez-Zor to pick up the fight with Kurdish and Syrian forces. According to the estimates of several YPG fighters, clearing the territory of Daesh* remnants could take from several days up to several weeks to carry out. "The time to negotiate and play around with these terrorists is over. 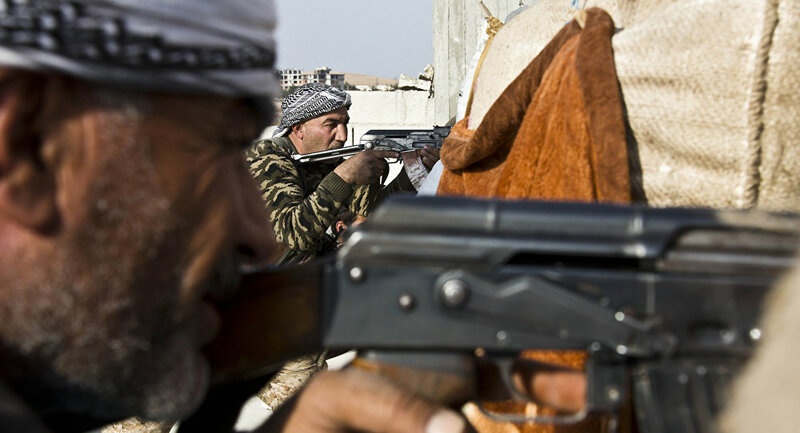 They need to give up or they die", an anonymous YPG commander reportedly said. However, the mop-up operations are complicated by citizens fleeing from areas occupied by the terrorist group. One Kurdish fighter told the Daily Star that "hundreds" are fleeing every day, with most of them being "Daesh* wives". In addition to the continual series of defeats by Kurdish and government forces, Daesh* is reportedly also suffering from internal squabbles. The Guardian reported on February 8, citing anonymous intelligence sources, that the leader of the terrorist organisation, Abu Bakr al-Baghdadi, had survived an assassination attempt on 10 January in a village near Hajin. The attack was allegedly part of an unsuccessful coup organised veteran foreign fighter Abu Muath al-Jazairi, who now has a bounty on his head. Over the course of the last two years, Daesh* has lost most of its territory in Syria and Iraq, which it gained during its rapid expansion in 2014-2016. The group has been forced to resort to hunkering down in hideouts located in the remaining territories under its control. In December 2017, Iraq officially declared the end of the war against Daesh*. One year later, US President Donald Trump followed suit and announced the withdrawal of American troops from Syria, noting that its remnants could be cleared out by regional forces.